This card was CAS’d from BJ Peters. I love this stamp from the “Easter Message” stamp set! 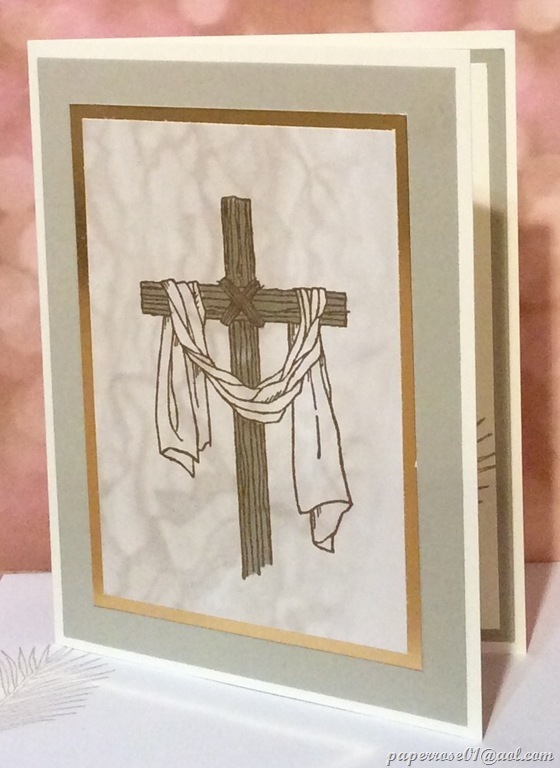 Although I am using this set for Easter, it is very appropriate for sympathy cards. These cards are super simple. This elegant card uses a Very Vanilla card base with Sahara Sand as the first layer. The image is stamped in Versa Mark on a piece of Falling in Love DSP and embossed with gold embossing powder and heat set. The cross is then colored in with your choice of several markers. BJ Peters who designed this card colored in the cloth area with the White Chalk Marker. I prefer to leave the cloth plain and add a bit of Wink of Stella. The embossed DSP is layered onto gold foil cs and adhered to the card front. The inside message I chose to gold emboss on the inside layer reads “He is not here; He has risen. Matthew 28:6.” I stamped a single palm frond in Sahara Sand on the lower right corner and on the envelope. And that, fellow crafters, is what we have for March Stamp Camp! As a reminder, dates/times for March Stamp Camp are Thursday March 2nd from 2 – 9 pm, Friday March 3rd from 2 – 9 pm, and Saturday March 4th from 9 am – 4 pm. I do ask you to let me know if you are going to come during the 6-9 pm time frame so that I can fix my mother’s dinner prior to your arrival. As long as you let me know by Tuesday, February 28th which cards you wish you to, I will have your custom packet ready. Please remember to let me know as soon as you can so I am not in a cutting panic on March 1st. Cost is $12 for 4 cards and $2 for each card beyond 4. On a personal note, it appears I will have neurosurgery on Monday, March 13th at 7:15 AM at Northwestern in Chicago. The procedure is Inter-body fusion S1 -T5 or 4. I had my preoperative appointment at Northwestern on Tuesday, February 21st. Had to give lots of blood. I will have 7-9 hours of surgery then will be in ICU at least overnight. After 7-10 days of hospitalization, I will transfer to inpatient rehab for 2-4 weeks. Marian Joy in Wheaton will be my first choice as it is acute rehab. My goal is to have Stamp Camp in May either the 4th, 5th and 6th or the 11th, 12th and 13th. The theme for May is “Honoring the Women in our Lives.” I have several new sets planned for May Stamp and am hoping I will be in shape by that date. I will be trading back pain for stiffness, but I am willing to do that. Your prayers will be appreciated! 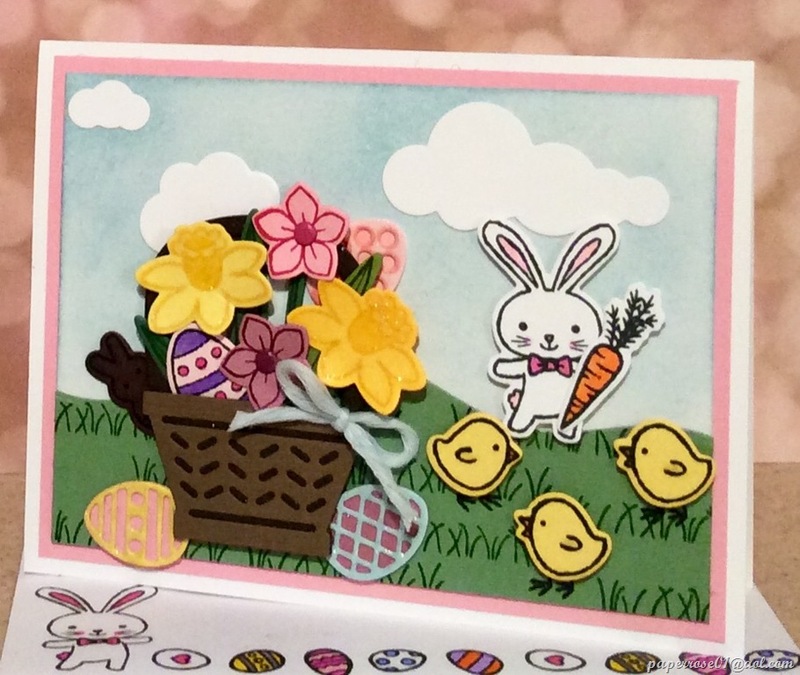 “Basket Bunch” is a darling stamp set for spring. 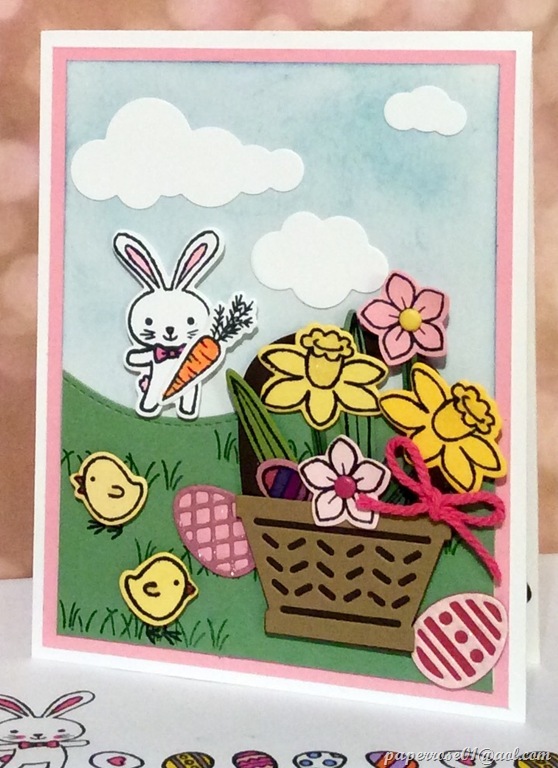 You can have a basket filled with flowers or Easter eggs, add some die cut grass and bunnies and you are ready to send a cute spring or Easter card. This is such a fun card to make. I chose to stamp my grass instead of using the die cut version that comes with the matching Basket Builder Framelits Dies. There is a lot of dimension with this card thanks to Stampin’ Dimensionals. The basket, bunny and chicks are all popped up. Because the two-tone basket is raised, the stems and flowers are also popped up. The sky is sponged with Marina Mist and Soft Sky and a few soft clouds give the spring feeling that warmer days are coming. If you love this set but want to do a card that is not quite as detailed, try doing the vertical version as you will use less stamps. To help streamline the process, I have pre-cut several of everything and have additional images stamped. One difference you may note between this sample and the horizontal sample above is the ink colors. Black ink was used for all the images to the left except for the Garden Green grass. 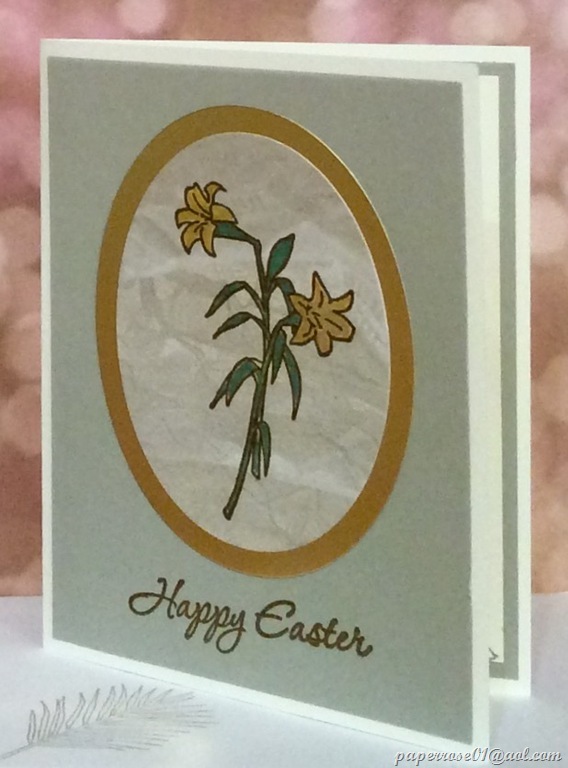 In the sample above, I used more colors for stamping the flowers, eggs, and basket greenery. The choice, of course, is up to you. Wink of Stella was also added to the finished card although you can’t see from the picture. Whew! One card to go for March Stamp Camp. Isn’t it great to be using these springy colors – pinks, yellows, lavenders? I love it!!!!! As I’m sure you are aware, dragonflies are very in trend right now. I hesitate about purchasing trendy stamp sets such as Dragonfly Dreams and coordinating dies, but I decided these would be great for masculine cards although this card is not manly due to the background use of some retired floral DSP. 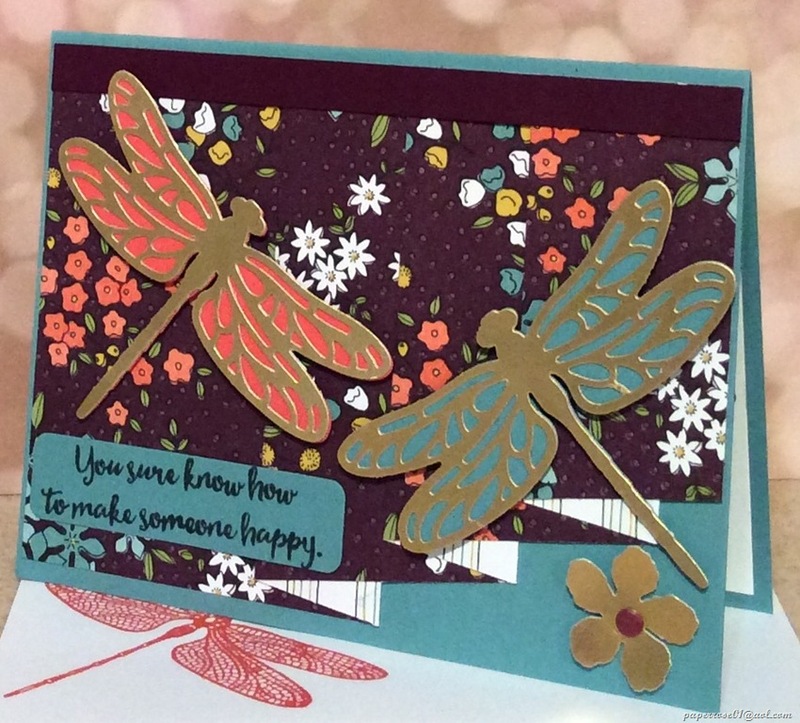 The dragonflies are die cut from gold foil and adhered over solid color cs with the Detailed Dragonfly Thinlits Dies. 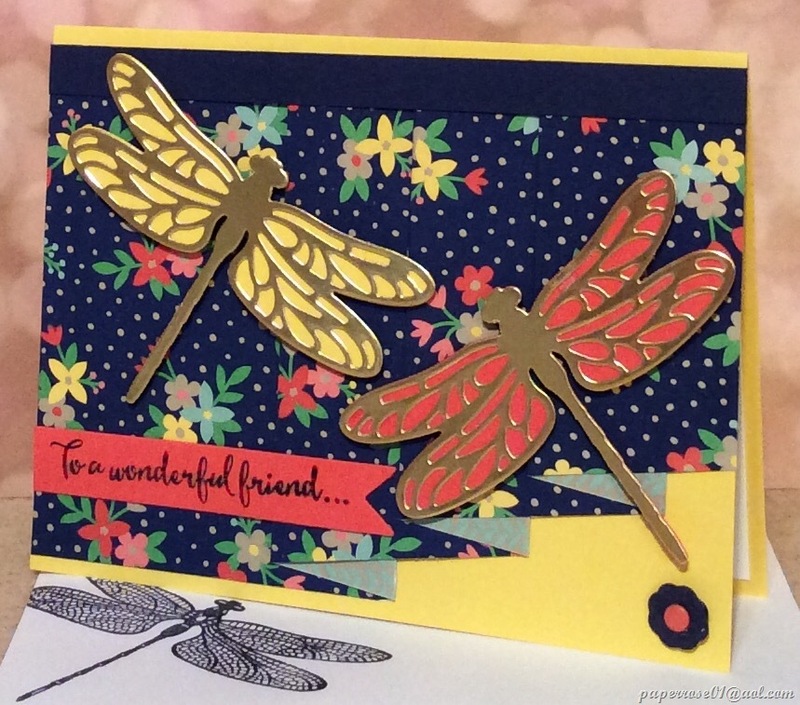 The finished dragonfly is then popped up with dimensionals and appears to be flying across the card. However, the really cool design on this card is the use of the drapery fold also known as the pleated skirt fold and the drapery pleat fold. There are several different dimensionals available to make this design fold. I tried 3 different dimensions/pleats and settled on this one which is quite easy. Basically, you start with a 11 1/2” X 4” DSP that has a nice pattern on the front and a coordinating pattern on the back. As you can see from these 2 samples, the back of the DSP peeks thru on the pleat bottoms. When I cut the DSP for March Stamp Camp, I may increase the angle to show more of the alternate pleat DSP. I used the score board to score the long side of my DSP at 3, 4, 6, 7, 9, and 10 inches. Then you fold hills and valleys until your DSP is pleated. A bit of adhesive holds the pleats in place and you adhere the completed panel to your card front. It may sound complicated, but it is really quite easy after you have completed your folds. I will be using a variety of attractive retired DSP for you to choose from. This is one of the early folds I did on a vertical card. 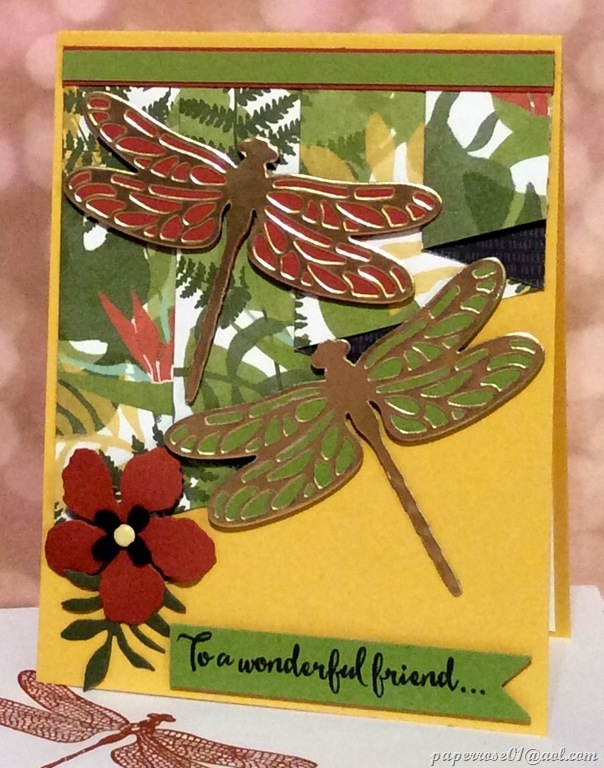 The dragonflies look very appropriate with this botanical jungle themed paper. I will have some of this DSP cut for the drapery fold, but will cut it as a choice for the horizontal card. Two cards to go! Don’t forget to let me know when you will be coming and which cards you want to make. Oh – and we will have yet ANOTHER drawing for the Sale-A-Brations set “Hey Chick”. This time, you will need to guess the number of jelly beans!!! 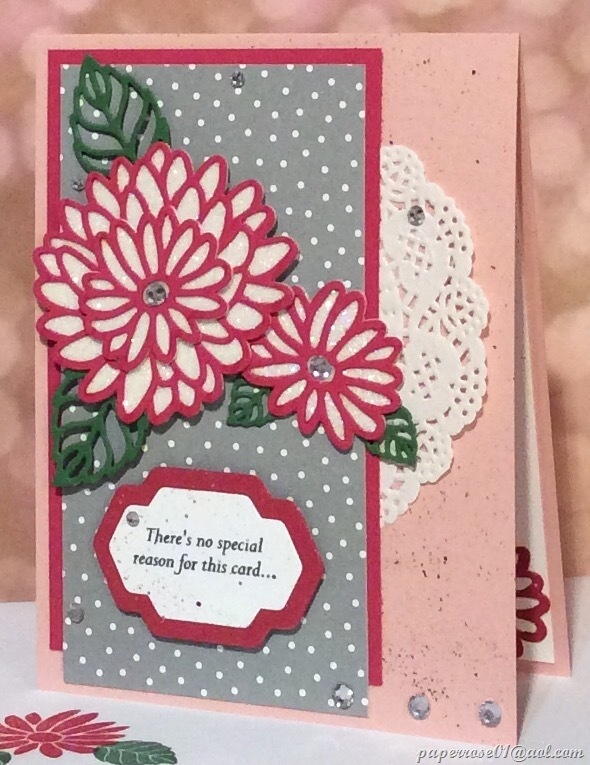 This card comes from the “Special Reason” stamp set and the Stylish Stems Framelits. The Blushing Bride card is accented with Rose Red flowers framing the Dazzling Diamonds glimmer paper background. Smoky Slate DSP from the Carried Away pack provides background interest. Flecks of color speckle the background and the white doily peeking thru softens the overall effect. 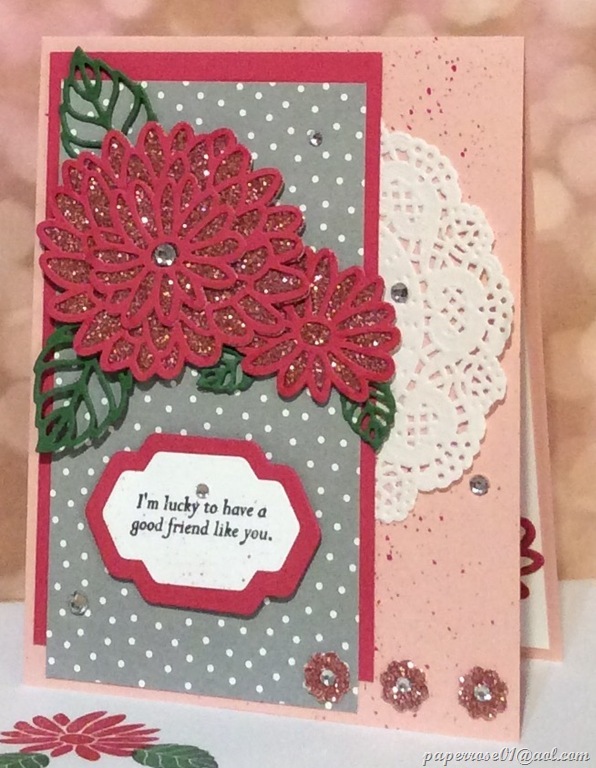 I added rhinestones in the flower centers and several throughout the card. This is a beautiful card for almost any occasion. The second sample was actually my first card and I tweaked the measurements of the DSP just a bit. The main difference between the two samples is the glimmer paper background for the Rose Red flowers. Blushing Bride was used in this sample and the overall card appears darker. It is actually more attractive than it looks. The embellishments in the lower right corner are also a bit different. These embellishments add weight to the right side of the card helping with balance. This card is not difficult or time consuming. The flowers and leaves die cut easily. You just need to insure you use sufficient liquid glue to insure the Rose Red flower will adhere to the roughness of the glimmer paper. So guess what our next card will be? It’s a new fold that several of you have asked for! Don’t forget to let me know when you will be coming and what cards you wish to do. $12 for 4 and $2 for each card beyond that. See you in a bit.